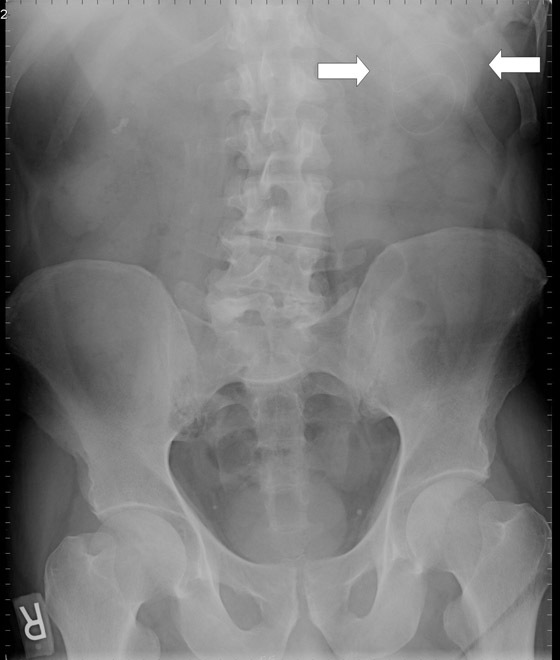 The supine abdominal radiograph showed a subtle soft-tissue–density mass around the ventriculoperitoneal shunt tip. 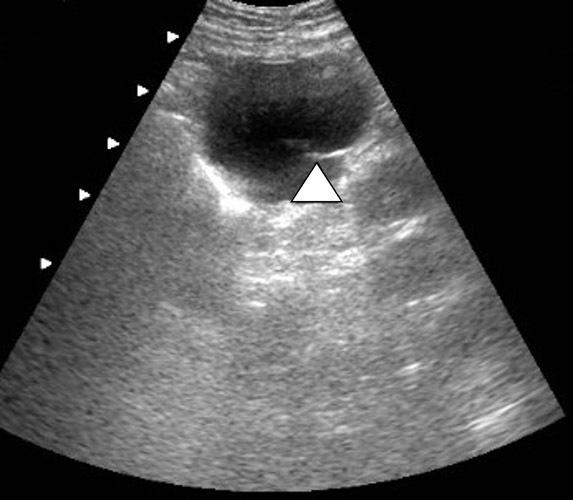 Ultrasound of the left upper quadrant of the abdomen showed an approximately 5 cm rounded cystic mass with the tip of the ventriculoperitoneal shunt within the collection. CT also demonstrated a cystic mass in close association with the ventriculoperitoneal shunt with the tip of the shunt lying within the collection. The patient underwent ultrasound-guided percutaneous aspiration of the pseudocyst with relief of symptoms. 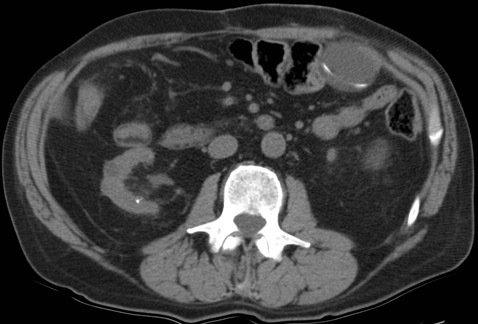 A 62-year-old patient presented with dull abdominal pain and palpable fullness in the left mid abdomen for several days. His past medical history was significant for a ruptured PICA aneurysm 2 years ago, which had been treated with clipping of the aneurysm anda ventriculoperitoneal shunt for hydrocephalus. Abdominal radiography, ultrasound and computed tomography (CT) scans were obtained (Figures 1–3). Histologically the wall of the pseudocyst is composed of fibrous tissue without epithelial lining and is filled with CSF. Ultrasound and CT can confirm the diagnosis. Ultrasound shows a well-defined lucent mass with posterior acoustic enhancement. A noninfected cyst will show uniform internal echotexture and septa that often occur in an infected pseudocyst. CT shows a cyst containing homogeneous water-density fluid. It is important to identify the shunt tip within the cyst for confident diagnosis. Abdominal CSF pseudocyst formation is a rare, but well-recognized complication of ventriculoperitoneal shunting. Identifying the tip of the shunt within the cyst on radiological studies helps in making the confident diagnosis. Murtagh FR, Quencer RM, Poole CA. Extracranial complications of cerebrospinal fluid shunt function in childhood hydrocephalus. AJR Am J Roentgenol. 1980;135:763-766. Agha FP, Amendola MA, Shirazi KK, et al. Unusual abdominal complications of ventriculo-peritoneal shunts. Radiology. 1983;146:323-326. Harsh GR 3rd. Peritoneal shunt for hydrocephalus, utilizing the fimbria of the fallopian tube for entrance to the peritoneal cavity. J Neurosurg. 1954;11:284-294. Ersahin Y, Mutluer S, Tekeli G. Abdominal cerebrospinal fluid pseudocysts. Childs Nerv Syst. 1996;12:755-758. Rovlias A, Kotsou S. Giant abdominal CSF pseudocyst in an adult patient 10 years after a ventriculo-peritoneal shunt. Br J Neurosurg. 2001;15: 191-192. Eschelman DJ, Lee VW. Lesser sac cerebrospinal fluid collection, an unusual complication of ventriculoperitoneal shunt. Clin Nucl Med. 1990;15(6):415-417. Pernas JC, Catala J. Case 72: Pseudocyst around ventriculoperitoneal shunt. Radiology. 2004;232:239-243. 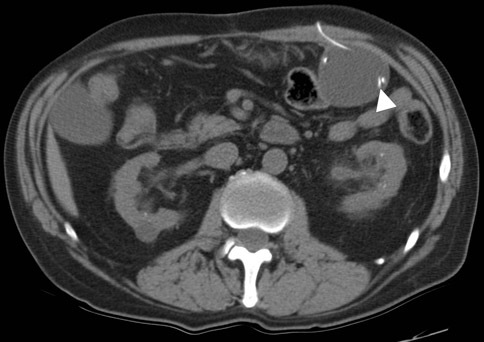 Abdominal CSF pseudocyst. Appl Radiol.